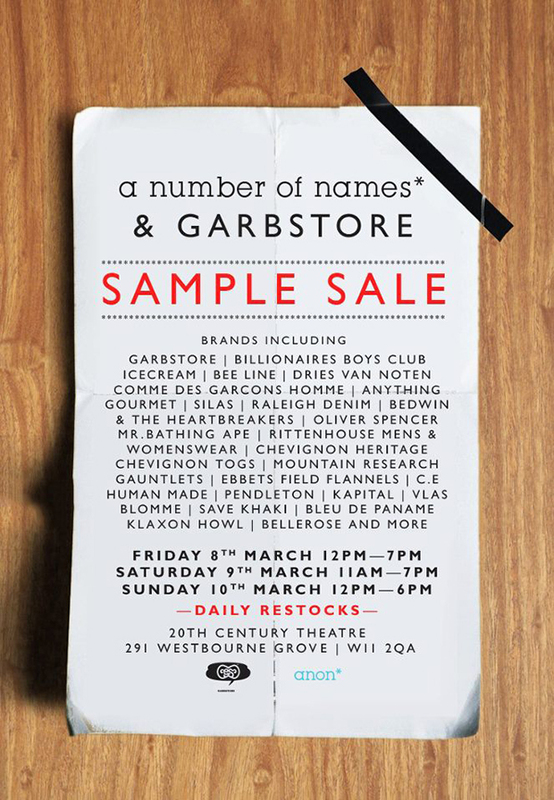 A trinity of hype will convene in West London next Friday, the 8th March, where a number of names* & Garbstore will collide with the addition of East London based store Anthem for an unmissable sample sale. Heading up the sale, alongside the regulars like Billionaire Boys Club, ICECREAM and Chevingnon Togs that have made appearances at previous ANON* sample sales, there will be a lot of new faces from the likes of C.E., COMME des GARÇONS, Mr Bathing Ape and a personal favourite of mine, Ebbets Field Flannels. Stock will be refreshed daily, along with deadstock additions from the Garbstore & ANON* archives. Expect to also find an endless supply of Gourmet shoes, with boxes of loose samples, factory seconds, and exclusive unsold items. Headwear will be provided by Ebbets Field and aNYthing, alongside eyewear from Le Specs and other accessories by Mr. Bathing Ape. The venue that will hold this rare event is the 20th Century theatre at 291 Westbourne Grove, just off Portobello Road. The sale kicks off at 12pm on Friday 8th March and runs throughout the weekend. You can expect there to be queues, so avoid disappointment and get down there early to reserve your spot.